Men are not superior by reason of the accidents of race or color. They are superior who have the best heart – the best brain. People have asked for it back. I’m reviving it in Tweet form. Let’s see how it works. Blasphemy is also a crime against God but, nothing can be more absurd than a crime against God. If God is infinite, you cannot injure him. You cannot commit a crime against any being that you cannot injure. Of course, the infinite cannot be injured. Man is a conditioned being. By changing his conditions, his surroundings, you can injure him; but if God is infinite, he is conditionless. If he is conditionless, he cannot by any possibility be injured. You can neither increase, nor decrease, the well-being of the infinite. Consequently, a crime against God is a demonstrated impossibility. The cry of blasphemy means only that the argument of the blasphemer cannot be answered. The priest finding that he has been attacked by common sense, by a fact, resorts to the same cry. Blasphemy is the black flag of theology, and it means: No argument and no quarter! It is an appeal to prejudice, to passions, to ignorance. It is the last resort of a defeated priest. Blasphemy marks the point where argument stops and slander begins. In old times, it was the signal for throwing stones, for gathering fagots and for tearing flesh; now it means falsehood and calumny. This was originally posted on April 16, 2010. I finally received a response and have posted it at the bottom. I have completed my letter of Actus formalis defectionis ab Ecclesia catholica and will be sending it to the Bishop of my former Diocese tomorrow. I was unaware that one could even formally defect from the church until I came across this post from Emptv.com a few weeks ago. 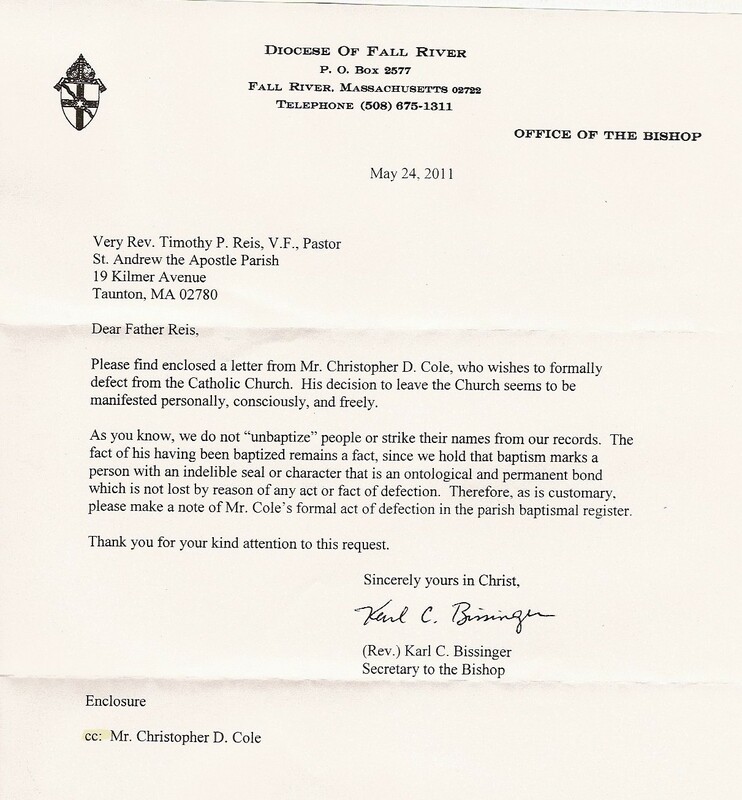 This letter won’t make me any less Catholic than I was yesterday, however it annoyed me that the church still considers me one of theirs and uses baptism records as statistics to claim how many adherents they still have. I’ll keep you posted if I get a response. I am writing to inform you of my defection from the Roman Catholic Church. I was born an atheist and then baptized into the Catholic Church as an infant which of course made it impossible for me to give my consent. My mother was a Catholic and mistakenly believed that it was her duty to raise me with her religion. Soon after receiving the Sacrament of Confirmation, my faith in Catholicism and religion in general began to fade. My childhood belief in God and the supernatural was replaced by a love of science which piqued and satisfied my curiosity about the world in a way that religion had never done for me. 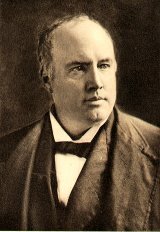 My love of literature led me to explore the writings of atheist and humanist authors such as Mark Twain, Robert G. Ingersoll, Bertrand Russell and Kurt Vonnegut. Their thoughtful words on the human experience taught me to think whereas priests had only taught me to believe. I would greatly appreciate it if you could send me written notification that you have complied with this request. I am fully aware of the consequences of my separation from the Church and accept them. I have found more love and comfort amongst family and friends than I ever could find kneeling in abject servitude to an ancient delusion. As an atheist, I have been able to find this love and happiness without the fear that myself or any of my loved ones could possibly spend an afterlife in eternal torment because they didn’t follow certain rules designed to keep people fearful and ignorant. Letting go of the belief of a deity has helped me keep an open mind and treat people of all different races, religions, genders and sexual orientations with the respect that is deserved and required for us to live harmoniously together. I no longer live for the good of a god, but only for the good of mankind. P.S. I do wish to thank the Diocese and St. Joseph’s Church in Taunton, MA for the lovely bible that they gave to me after my confirmation. I read it from beginning to end as was suggested. The monstrosities contained in that book by a “loving” God upon his followers helped hasten my departure from the Church more expediently than any atheistic book ever could. After a few months of not getting a reply, I thought they may have just thrown the letter out. I didn’t really care if I received a response or not because you don’t need permission from any organization or individual to stop believing in a religion. The letter was just a form of protest against a group that I had been indoctrinated into before I was mature enough to give my consent. Also, the Catholic Church is a powerful organization that lobbies its archaic positions politically and I wanted to do everything within my power to make sure I am not supporting them in any way. Formally defecting was the least I could do to have a note of protest put in my baptismal records. The paragraph in the letter about the indelible seal was completely expected and is illustrative of how childish the Catholic Church was and remains. That some adults feel that pouring water over an infant’s head while muttering incantations makes a person a part of an organization for life no matter what this person is taught or ends up believing just reinforces my opinion of the church’s deceitful and bullying nature. A person’s faith should be what they believe, not about that time they bathed in front of a congregation. 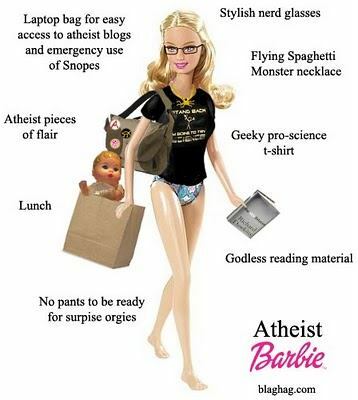 In response to the new Episcopalian Reverend Barbie (seriously), Blag Hag envisions an atheist Barbie complete with bagged lunch.